A pair of legs stick out from underneath a toppled bus in Dorarp, Sweden. The survivors huddle together at the site of the crash, wrapped in blankets, grieving, angry at the driver, the road, the weather, and the country of Sweden in general. The night before, four men had drawn cards to determine who slept in which bunk, and Cliff Burton drew the ace of spades. “I want your bunk!” he said to Kirk Hammett, who moved to another bed at the front. When the bus skidded off the road early in the morning of September 27, 1986, Burton was thrown through the window, and when the bus tumbled on top of him, he was killed instantly. Metallica formed in Los Angeles in 1981 when Lars Ulrich placed a classified ad in The Recycler reading, “Drummer looking for other musicians to jam with, Tygers Of Pan Ting, Diamond Head, Iron Maiden.” James Hetfield, the shy son of Christian Scientists, answered, although he wasn’t impressed. Ulrich wasn’t a particularly good drummer at the time, but he also wasn’t the type to let something like an inability to play an instrument stop him. His insatiable enthusiasm secured him a place on a compilation album, The New Heavy Metal Review Presents Metal Massacre, despite not having a song to record, or even a band. It was this promise of a track on an album that convinced Hetfield to join him, and Metallica was born. Ulrich’s vision and Hetfield’s lyrics set Metallica apart from the rest of the underground thrash metal scene, and the duo’s reputation in that world allowed them to cherry-pick talented musicians from other, less-promising bands. While Ulrich and Hetfield experimented with different lineups, the band moved from Los Angeles and its glam-rock venues to San Francisco, where new bassist Cliff Burton assured them that metal was ascendent. In those days, Metallica was known for speed, ferocity, and general dickishness. The group trashed the recording studio in which it recorded Kill ’Em All, its vicious, pummeling, punk-inspired debut LP. The album was co-written by Ulrich, Hetfield, and lead guitarist at the time Dave Mustaine, although Mustaine didn’t play on the tracks. The rest of the band had kicked him out right before recording began for being too drunk and obnoxious even for a band that jokingly referred to itself as Alcoholica. For his part, Mustaine went on to found Megadeth, although he never really moved on; in the 2004 documentary Some Kind Of Monster, the 42-year-old tears up as he vents decades of resentment to Lars Ulrich, disgusted with his dozens of trips to rehab, and tormented by the idea that everything would have been better, if only he hadn’t been fired. 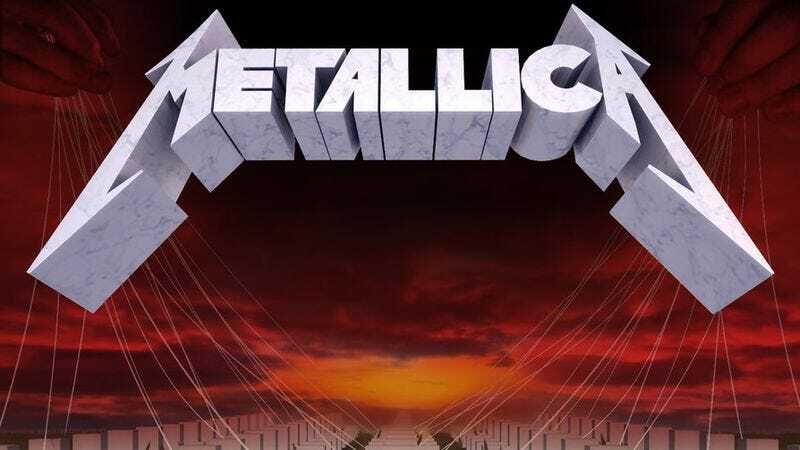 Master Of Puppets, Metallica’s major label debut, was the first album written entirely by the lineup of Hetfield, Ulrich, Hammett, and Burton, and the band’s growth is staggering. The songs grew, too: They’re longer, more dense with ideas, and feature multiple musical movements, so an album with the same number of tracks as Ride The Lightning wound up seven-and-a-half minutes longer. Thematically, it’s the most focused album in Metallica’s discography, an exploration of, as Hammett said, “manipulation in all its various forms.” There’s still plenty of violence, but it arises from a place of helplessness or the feeling that someone or something is pulling your strings. On album opener “Battery,” that something is insanity. Seen through this lens, the acoustic strumming that kick off the song is more than a tease; it’s a glimpse into a healthy mind before it’s overcome with madness. “Smashing through the boundary / Lunacy has found me / Cannot stop the battery,” Hetfield sings, utterly out of control, wedding the lyrical nuance he first found on Ride The Lightning tracks like “For Whom The Bell Tolls” and “Fade To Black” with the furious speed of Kill ’Em All. “Damage, Inc.” is in some ways a typical thrash song, one that wouldn’t have sounded out of place on Kill ‘Em All, except for Burton’s minute-long introduction. The halting, haunting chords flicker and fall, swell and die, before abruptly giving way to an old-fashioned speed-freak banger. Lyrically, it’s a gleeful massacre, a companion piece to “Battery” with a chorus of, “Blood will follow blood / Dying time is here / Damage Incorporated.” As for the introduction, Burton was inspired by a baroque aria by J.S. Bach. Considering the lyrical content of “Damage, Inc.,” Burton’s riff on the Bach masterpiece “Come, Sweet Death” serves double duty as a melancholy intro and a morbid joke. Master Of Puppets was released on March 3, 1986. The band opened for Ozzy Osbourne on his Ultimate Sin tour, and according to Hammett, “We converted people night after night… Your typical Ozzy fan might not have gotten Metallica, but two or three years later, they were all saying, ‘Yeah, I saw Metallica with Ozzy, and they blew him away!’” Despite no radio play and no music videos, Master Of Puppets was purchased half a million times within a few short months, peaking at Number 29 on Billboard, and giving the band its first gold record. Metallica had burst into the mainstream. “It was almost magical,” says Hammett, “because it seemed like everything we played went right, every note we played was in exactly the right spot, and it couldn’t ever have gone any better. It was just a very, very special time.” The tour with Osbourne was the second-largest ticket draw in the United States that year, and Metallica planned a headlining tour across Europe: First England, then Norway and Sweden in September, and onwards to Japan. After the constant lineup turnover—the quitters, the fired, the long shadow cast by Dave Mustaine—Metallica finally knew what, and who, it was: James Hetfield, Lars Ulrich, Kirk Hammett, Cliff Burton. The four best friends were the most exciting rock band on the planet, and they boarded the plane for their European tour ready to conquer the world.